LAS CRUCES — An upcoming heavy metal concert has the police department beefing up patrols, the hospital bringing in extra security guards and the jail considering transferring some prisoners to make room for new arrivals. “I would prefer if the whole thing just went away,” Police Chief Pete Hampton said. But New Mexico State University officials say they’re not worried about the Aug. 27 concert featuring Guns N' Roses, Metallica and Faith No More. Welk,” said Barbara “Mother” Hubbard, director of the university’s special events. Still, “everyone is planning for the worst possible scenario,” Hubbard said. That includes NMSU, which has hired extra security and two doctors for the concert at Aggie Memorial Stadium. Guns N’ Roses’ lead singer, Axl Rose, dove off a stage in St. Louis during the band’s last tour, sparking a riot and sending more than 200 people to the hospital. More than 60 uniformed police and 250 security personnel will be at the stadium during the nine-hour event. Another 40 off-duty military police will work the parking lots, Hubbard said. “We’re going to start doing the same thing as some of our weekend programs — zero-tolerance — for three days, the day before the concert, day of the concert and the day after the concert,” Hampton said. The Doha Ana County Detention Center is considering transferring some of its prisoners to the Southern New Mexico Correctional Facility to make room for overzealous concert-goers, County Manager Don Brooks said. And Memorial Medical Center is bringing in extra security guards and placing another six on standby the day of the event, said Ruth Padilla, the hospital’s director of marketing and public relations. New Mexico State University officials say they want to create a safe environment for the triple-header concert featuring Guns N’ Roses, Metallica and Faith No More. Barbara Hubbard, director of special events for the university, said she is confident the seven-hour show will go well. The concert is expected to draw 35,000 fans. Only about 100 tickets remain. Faith No More takes the stage at 6:30 p.m. for about 40 minutes. Metallica is slated to start its set at 7:45 p.m. Guns N’ Roses is scheduled to play at 10:30 p.m., Hubbard said. “We’ve had 33,000 people here for UTEP games, and that’s gone well. We are confident that this concert will go smoothly, or else we wouldn’t have booked it,” Hubbard said. • Parking — The north entrance to the stadium will be closed for construction, but the south entrance will have 20 gates open with two turnstiles to each gate. Parking will cost $2 and Hubbard discourages pre-concert partying at the stadium. “There will be no tailgate parties. We don’t want any alcohol on campus.” Gates will open at 4:30 p.m.
•	What to bring — Attendants will be allowed to bring in water containers. Concertgoers will not be allowed to take in lawn chairs, umbrellas, blankets or anything other than water containers. •	Facilities — Sixteen concession stands will be open throughout Aggie stadium. Inside the arena, there will be 150 portable restrooms added to the six major restrooms. • Security — Hubbard said there will be metal detectors set up at the entrances at the request of the bands. More than 60 uniformed police and more than 300 security personnel will be on hand, plus 40 off-duty military police working the parking lots. ■	When: 6:30 p.m. Aug. 27. ■	Where: Aggie Memorial Stadium, New Mexico State University in Las Cruces. ■	How much: Tickets, available at Dillard's, UTEP, Pan Am and Fort Bliss ITR box offices, are $28.25. ■	Information: (505) 646 1420. LAS CRUCES — A preacher aired radio spots asking parents to bring children to his church. Authorities have increased security at New Mexico State University. Get ready, New Mexico. Guns N’ Roses is coming. 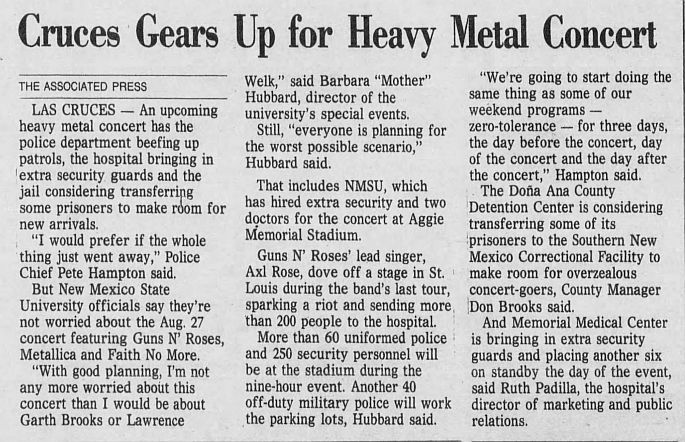 Officials said about 300 police and security officers will oversee an anticipated crowd of 40,000 headbangers today when the heavy metal band Guns N’ Roses performs at Aggie Memorial Stadium. The nine-hour show is being promoted as New Mexico’s first big-time stadium concert. The supporting bands include Metallica and Faith No More. The Rev. Jim Franklin held meetings on Monday and Tuesday at First Assembly of God to examine heavy metal philosophy and its impact on young people. While he said he doesn’t advocate censorship, Franklin said parents should be aware of the music and lyrics. “There is definitely a link with violence, sexism and an overwhelming link to Satanism, the occult,” Franklin said. Guns N’ Roses, which performed Tuesday in Phoenix, arrives in New Mexico after a series of mishaps and canceled shows across North America. On Aug. 8, fans attending a Montreal show looted souvenir stands after Rose complained of a sore throat and walked offstage. An Aug. 11 show in Seattle was postponed and an Aug. 10 concert in Vancouver, British Columbia, was canceled outright. Prosecutors in St. Louis say Rose jumped into the crowd during a July 1991 concert, starting an uproar in which at least 65 people were injured. Rose has pleaded innocent in the case, blaming poor security for a riot that caused about $300,000 in damage to facilities. Las Cruces Police Lt. Conrad Perea said local authorities are prepared for any emergencies the concert might cause. He said he doesn’t expect the problems that plagued earlier shows. LAS CRUCES — The city is braced for trouble tonight as notorious bad boys Guns Ν’ Roses hit the stage at Aggie Memorial Stadium for a sold-out concert expected to draw about 40,000 people. Heavy metal heavyweight Faith No More starts warming up at 6:30 p.m. for co-headliner Metallica. The event — billed as New Mexico’s first big-time stadium concert — could last until 1 a.m.
Las Cruces police will have about 60 more officers and support personnel on the streets than usual, Chief Pete Hampton said. “We’re doubling up,” he said. “We’re having one shift work late and the other one come in early.” Besides 50 extra commissioned law enforcement officers, a dozen police academy cadets will help with such duties as directing traffic. “The major concern for us is the influx of out-of-town people,” Hampton said, noting the town could be ripe for auto thefts and auto burglaries. "I imagine we’ll have noise calls also,” he said. More than 300 police and security officers will watch over the stadium during the concert. Guns Ν’ Roses, which performed Tuesday in Phoenix, arrives in New Mexico after a series of mishaps and canceled shows across North America. 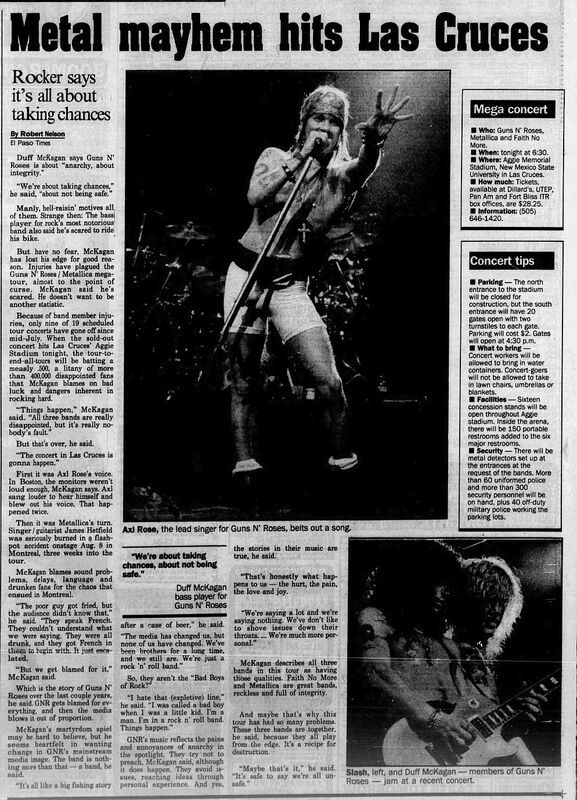 •	Fans attending a Montreal show Aug. 8 looted souvenir stands after lead singer Axl Rose complained of a sore throat and walked offstage. •	An Aug. 11 show in Seattle was postponed and an Aug. 10 concert in Vancouver, British Columbia, was canceled outright. This week in Las Cruces, a preacher aired radio spots asking parents to bring children to his church. The Rev. Jim Franklin had meetings Monday and Tuesday at First Assembly of God to examine heavy metal philosophy and its impact on young people. While he said he doesn’t advocate censorship, Franklin said parents should be aware of the music and lyrics. New Mexico State University student Hector Castaneda, who’s from Los Angeles, said Las Cruces may be in for a surprise. His dormitory room is almost directly across the street from the stadium. “I’m just going to cruise out to this parking lot and watch the concert for free." said Castafteda, a junior. “I’m going to stay pretty vigilant because I’m from (Los Angeles) and I know what happens. I won’t go to sleep until the concert's over and everybody’s gone. His neighbor, freshman Chad Stickle, who recently moved to Las Cruces from Virginia, predicted the violence seen at the Montreal and St. Louis concerts won’t be repeated in Las Cruces. Concert promoter Barbara Hubbard, special events director at NMSU, said she doesn’t think so either. She said NMSU is well prepared for the crowd. “We’ve got more security than the president of the United States would ever need,” she said. Guns ’N Roses and Metallica will give New Mexico State football players a special gift this afternoon — a day off. The concert, which will have a crowd of 35,000 in Aggie Memorial Stadium tonight, has secured the area. A tarp will be placed on the football field early this morning to help protect the surface. Even the nearby Pan American Center will be closed at noon today. NMSU head football coach Jim Hess said he isn’t worried too much about the condition of the stadium playing surface. “I don’t think it’ll hurt it. I really don’t think so. They might have a little trouble getting it ready for Saturday's high school game, but I think it’ll be all right for us,” Hess said. Wednesday the football stadium looked like a construction sight as the crews were getting ready to tonight’s show. Security guards were at the gate, allowing no one through except workers and Aggie football players and coaches. Hess was his usual impeccable self — cruising into practice, relaxed, smiling, wearing a red bandana for a headband — looking like he was ready for Willie Nelson, not Axl Rose. The only change that really affected the Aggies was which day they got off. They have not missed a day since beginning practice. Now, since school has started, NCAA rules dictate a team must get one day off a week. ■ Who: Guns Ν’ Roses, Metallica and Faith No More. ■ When: tonight at 6:30. ■ Where: Aggie Memorial Stadium, New Mexico State University in Las Cruces. ■ How much: Tickets, available at Dillard’s, UTEP, Pan Am and Fort Bliss ITR box offices, are $28.25. ■ Parking — The north entrance to the stadium will be closed for construction, but the south entrance will have 20 gates open with two turnstiles to each gate. Parking will cost $2. Gates will open at 4:30 p.m.
■ What to bring — Concert workers will be allowed to bring in water containers. Concert-goers will not be allowed to take in lawn chairs, umbrellas or blankets. ■ Facilities — Sixteen concession stands will be open throughout Aggie stadium. Inside the arena, there will be 150 portable restrooms added to the six major restrooms. ■ Security — There will be metal detectors set up at the entrances at the request of the bands. More than 60 uniformed police and more than 300 security personnel will be on hand, plus 40 off-duty military police working the parking lots. LAS CRUCES — The only heavy metal left at Aggie Memorial Stadium Friday afternoon were the trestle-type support beams of the colossal stage used in the previous day’s eight-hour Guns N’ Roses-Metallica concert. Just about a ton of garbage was left behind by the crowd of 35,300 concertgoers — making it the largest stadium-size rock concert ever held in New Mexico. But, despite earlier fears and some negative advance publicity, there were some scattered arrests but no riots. Las Cruces police Lt. Conrad Perea said officers responded to 203 calls, involving anything from fistfights to disturbing the peace during the concert, which ended at about 2 a.m.
Perea, who was in charge of a 65-member concert force, said police arrested 15 individuals, issued 17 criminal citations and handled eight minor traffic accidents linked directly to the concert. Two days before Thursday’s concert, Rev. Jim Franklin of the Las Cruces First Assembly of God church decried the event. 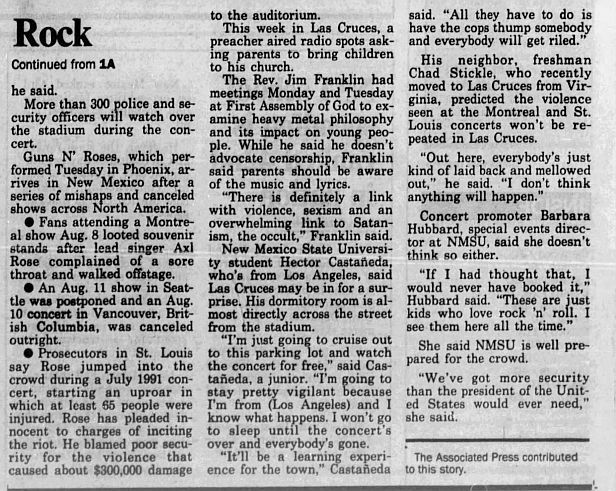 Franklin said, “There is definitely a link with violence, sexism and an overwhelming link to Satanism” and rock ’n’ roll. 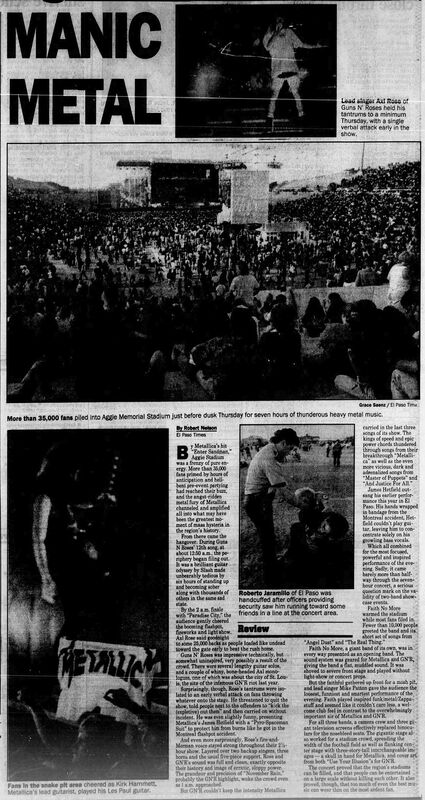 And shortly before the Guns N’ Roses, Metallica and Faith No More concert, Las Cruces police and NMSU security officials beefed up their numbers to about 300 to anticipate any problems, up to and including a riot. On Aug. 10, angry Canadian Guns N’ Roses fans rioted at Montreal’s Olympic Stadium after the band’s singer Axl Rose walked off the stage less than an hour into the show, complaining of a sore throat. At least eight of the 300 Montreal police officers called to quell the melee were injured. Then on July 12, Rose was arrested in New York on four misdemeanor counts of assault and one count of damage to property in connection with another riot during a July 1991 performance in St. Louis. Rose, 30, has pleaded innocent to the charges and has blamed poor security for the riot that caused about $300,000 in damage. Rose, whose trial has been set for Oct. 13, faces up to four years in prison and a $4,500 fine. LAS CRUCES — A sea of raised fists and Bic lighters engulfed the field of Aggie Memorial Stadium Thursday night as heavy metal groups Guns N’ Roses and Metallica rocked hard — and relatively peacefully — in the region’s largest concert ever. More than 35,000 fans packed New Mexico State University’s stadium, a mass of youth many feared would spark violence. But as of 9:30 p.m. only 15 people had been arrested for minor offenses, a number university police said was remarkably low for such a crowd. Interstates 10 and 25 quickly clogged near the university Thursday as thousands of cars poured into the stadium parking lot. Some fans, frustrated by the delays, abandoned their cars along the interstates and walked more than a mile to the stadium. At the stadium, concertgoers stood in a quarter-mile line leading to the south gates, where security guards frisked everyone entering. Contraband such as alcohol, cameras and tape recorders were seized. A combined force of nearly 500 police and security guards was on hand to quickly quell any problems that might develop. The lack of serious incidence at the concert left most attention where it should be — on the bands. “This is an incredibly exciting concert,” said Jim Vasquez, a junior at the University of Texas at El Paso. “To see them in the stadium — it’s cool." The north end of Aggie Memorial Stadium was transformed into a massive stage flanked by two giant maroon skulls and three 20-foot-wide video screens. 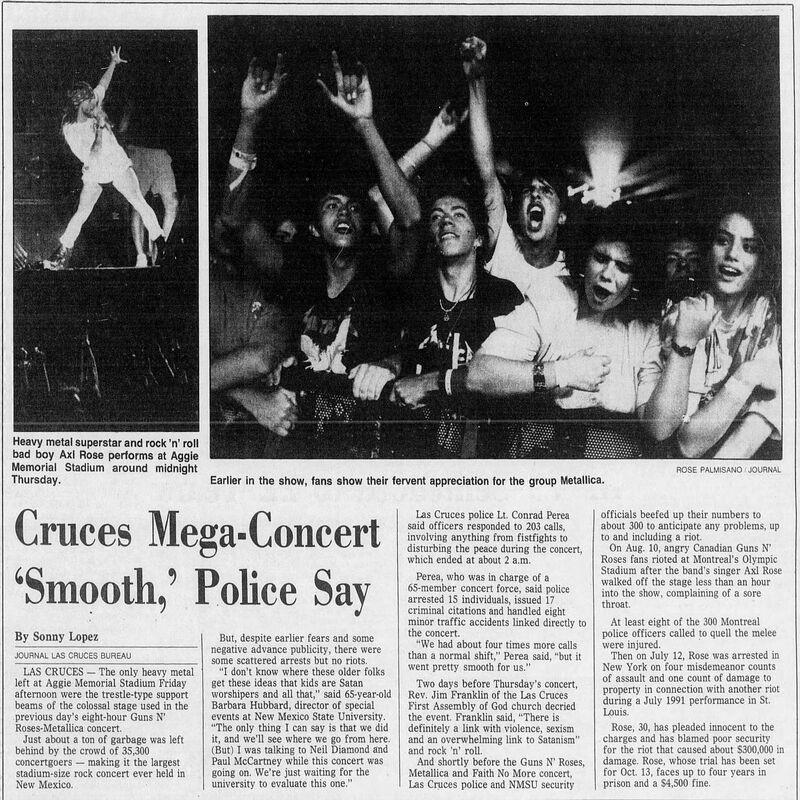 Fans of opening band Faith No More slam danced in front of the stage during that group’s 45-minute performance, then disappeared in the crunch of fans pushing to see Metallica. Metallica played for nearly two hours and ended their show with a spectacular fire-works display before giving way to the headliners — Guns N’ Roses. 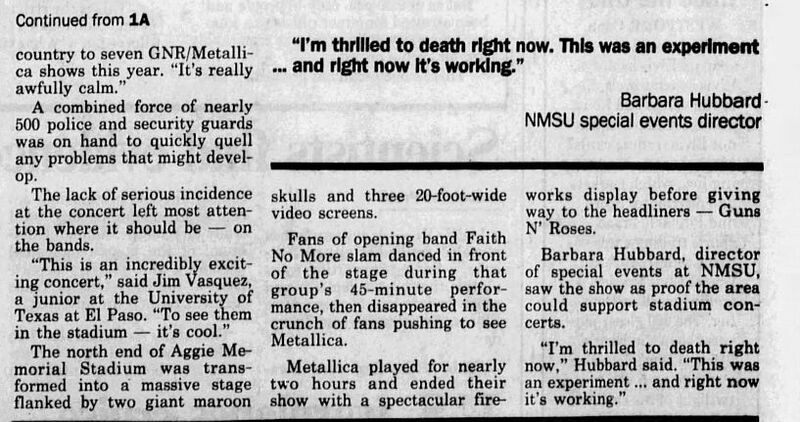 Barbara Hubbard, director of special events at NMSU, saw the show as proof the area could support stadium concerts. “I’m thrilled to death right now,” Hubbard said. "This was an experiment... and right now it’s working." ■	Security: 150 uniformed police officers, 300 security guards In T-shirts, 40 uniformed private security guards. ■	Arrests: 15 as of 9 p.m.
By Metallica’s hit “Enter Sandman,” Aggie Stadium was a frenzy of pure energy. More than 35,000 fans primed by hours of anticipation and hellbent pre-event partying had reached their buzz, and the angst-ridden metal fury of Metallica channeled and amplified all into what may have been the greatest moment of mass hysteria in the region’s history. From there came the hangover. During Guns N Roses’ 12th song, at about 12:50 a.m., the periphery began filing out. It was a brilliant guitar odyssey by Slash made unbearably tedious by six hours of standing up and becoming sober along with thousands of others in the same sad state. By the 2 a.m. finale with "Paradise City,” the audience gently cheered the booming flashpot, fireworks and light show. Axl Rose said goodnight to some 25,000 backs as people loafed like undead toward the gate early to beat the rush home. 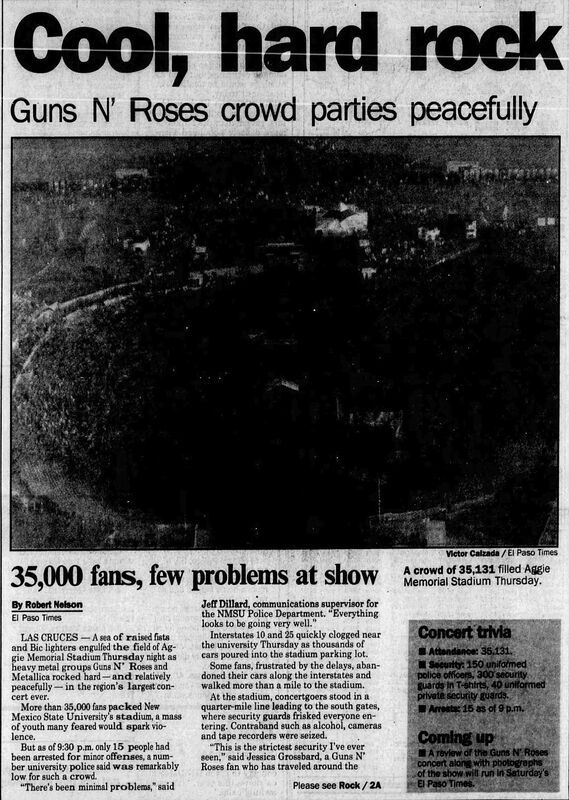 Guns N’ Roses was impressive technically, but somewhat uninspired, very possibly a result of the crowd. There were several lengthy guitar solos, and a couple of whiny, bone-headed Axl monologues, one of which was about the city of St. Louis, the site of the infamous GN’R riot last year. Surprisingly, though, Rose’s tantrums were isolated to an early verbal attack on fans throwing whatever onto the stage. He threatened to quit the show, told people next to the offenders to “kick the (expletive) out them” and then carried on without incident. He was even slightly funny, presenting Metallica’s James Hetfield with a ‘Pyro-Spaceman Suit" to protect him from burns like he got in the Montreal flashpot accident. And even more surprisingly, Rose’s fire-and-Merman voice stayed strong throughout their 2 1/2-hour show. Layered over two backup singers, three horns and the usual five-piece support, Rose and GN’R’s sound was full and clean, exactly opposite their history and image of erratic, sloppy power. The grandeur and precision of “November Rain,” probably the GN’R highlight, woke the crowd even as 1 a.m. approached. But GN’R couldn't keep the intensity Metallica carried in the last three songs of its show. The kings of speed and epic power chords thundered through songs from their breakthrough “Metallica’’ as well as the even more vicious, dark and adrenalized songs from “Master of Puppets" and “And Justice For All.” James Hetfield out-sang his earlier performance this year in El Paso. His hands wrapped in bandage from the Montreal accident, Hetfield couldn’t play guitar, leaving him to concentrate solely on his growling bass vocals. Which all combined for the most focused, powerful and inspired performance of the evening. Sadly, it came barely more than halfway through the seven-hour concert, a serious question mark on the validity of two-band showcase events. Faith No More warmed the stadium while most fans filed in. Faith No More, a giant band of its own, was in every way presented as an opening band. The sound system was geared for Metallica and GN’R, giving the band a flat, muddled sound. It was shoved to severe front stage and played without light-show or concert props. But the faithful gathered up front for a mosh pit, and lead singer Mike Patton gave the audience the loosest, funniest and smartest performance of the evening. Faith played inspired funk/metal/Zappa-stuff and seemed like it couldn’t care less, a welcome club feel in contrast to the overwhelmingly important air of Metallica and GN’R. For all three bands, a camera crew and three giant television screens effectively replaced binoculars for the nosebleed seats. The gigantic stage also worked for a stadium crowd, spreading the width of the football field as well as flanking center stage with three-story-tall interchangeable images — a skull in hand for Metallica, and cover art from both “Use Your Illusion”s for GN’R. The concert proved that the region’s stadiums can be filled, and that people can be entertained on a large scale without killing each other. It also proved, though, that too much of even the best music can wear thin on the most ardent fan. I can’t believe people actually got offended by the remark Axl Rose made about throwing things on stage at last week’s Guns N’ Roses concert. Nobody threw anything at Metallica? Why, then, did people start throwing things when Guns N’ Roses got on stage? I’ll tell you why. Because of the bad reputation Guns N’ Roses has. 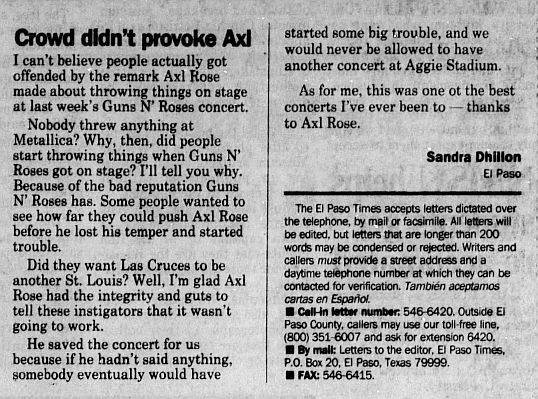 Some people wanted to see how far they could push Axl Rose before he lost his temper and started trouble. Did they want Las Cruces to be another St. Louis? Well, I’m glad Axl Rose had the integrity and guts to tell these instigators that it wasn’t going to work. 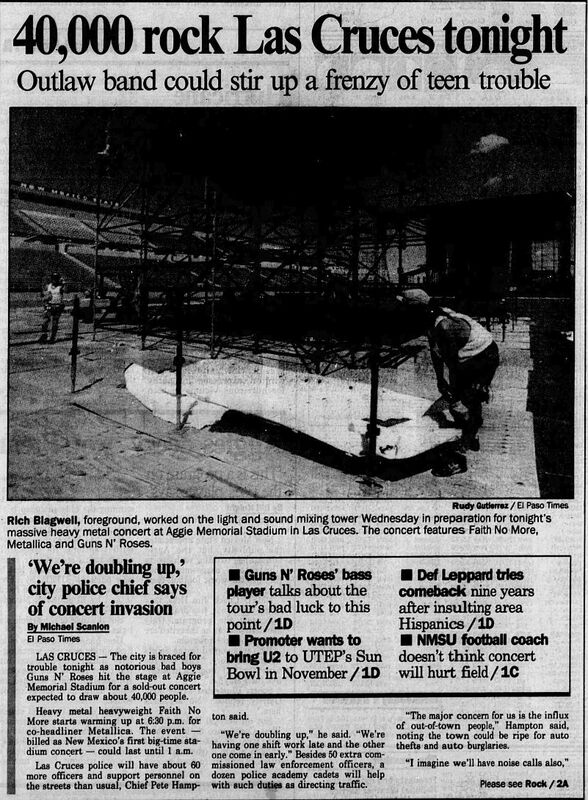 started some big trouble, and we would never be allowed to have another concert at Aggie Stadium. As for me, this was one of the best concerts I've ever been to — thanks to Axl Rose.